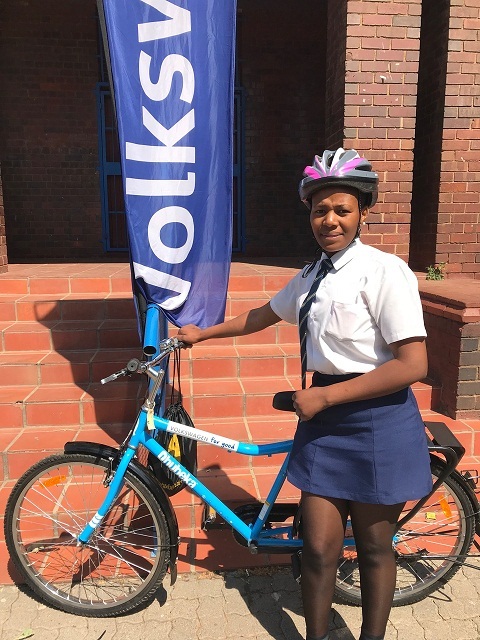 VOLKSWAGEN SOUTH AFRICA, under its “Volkswagen for Good” initiative has partnered with Qhubeka for the fourth instalment of the Bicycle Education Empowerment Programme (BEEP) handover, this time in Orlando, Soweto. On Thursday, Volkswagen and Qhubeka delivered 240 ‘Blue Bikes’, as they are affectionately known, to Bona Comprehensive High School, Selelekela Secondary School and the Orlando Community Policing Forum, which keeps the bicycle recipients and their communities moving forward. Fiona, recipient of a ‘Blue Bike’ at a ceremony made possible by VSA and Qhubeka in Soweto. In the first quarter of 2018, Blue Bikes were donated to communities in Bergville (Kwa-Zulu Natal) and Alexandra (Gauteng), with another handover scheduled to take place in Uitenhage (Eastern Cape) in November. Part of the drive to contribute a significant amount of Blue Bikes across South Africa’s communities is key to Volkswagen’s principles. “Our sole purpose at Volkswagen is to move people forward and helping them progress further on their life journey. The direct impact is invaluable. When you hear of scholars who dream of being Chattered Accountants one day and are now empowered to get to school on time and attend every class, this leaves a lasting impression when it comes to the future of our country,” said Thomas Schaefer, Chairman and Managing Director of Volkswagen Group South Africa, sharing a testimony of one of the 2015 recipients, 12-year-old Lungisani from Maquqa Secondary School in KwaZulu Natal. In the last four years, Volkswagen together with Qhubeka, have mobilised thousands of school children alleviating the pressure of commuting in remote rural areas. Of South Africa’s 17-million school children, 11 million walk to get to school, which can take up to four hours to commute on foot. These long journeys can lead learners to miss lessons and can leave them tired making it difficult to concentrate in class. Ziphezinhle was in matric when he received his Qhubeka Bicycle in August 2017. Before he had the bicycle, it took him 55 minutes to walk to school every day and with his Blue Bike it takes him 15 minutes. “The bicycle helped to reduce the stress of walking and it has given me a lot of time for doing other necessary things,” he said. He uses the bicycle to get to school, sports activities and the shops leaving him more time to spend studying and researching. “The best thing about the bicycle is that it is easy to maintain,” he added.